Lost in the fun and glory and scenery and excitement of a really great year at the Tour de France. Alright, this year I experienced the Tour from my laptop, desktop, TV, phone, facebook, and twitter accounts, but it was all-consuming and I was there! I'm sure I was. In fact I keep looking for my suitcase to unpack, it seemed so real from my virtual world. Typically this time of year (or more like every other year) I am a few pounds lighter after riding in France, sick-and-tired of eating too many croissants, adjusted to living out of one suitcase - and liking it, hypersensitive to wasting energy (electricity is darn expensive in France! ), overly focused on where to find the next restroom, absolutely addicted to cafe, and in the habit of saying bonjour to everyone I meet. This year I have none of that. Just a fading memory of one of the best Tour de France races in many years. I am in the strange post-tour hinterland, somewhat lost and trying to find my way to inspiration. People are visiting my blog looking for information on Fabian Cancellara's wife and Frank Schleck's wife, whether Bernie Eisel has a girlfriend, and wanting pictures of George Hincapie's legs. Thank goodness people are still interested in bikes, because I am not drawn to answering those other topics. Instead I am shocked by my own longing to once again see Thomas Voeckler ride a bike. This is all strange behavior. The USA Pro Cycling Challenge (a.k.a Quiznos Pro Challenge, Tour of Colorado, Colorado Pro Challenge, That New Bike Race in Colorado Phil and Paul Shamelessly Promote, whatever you call it) is coming into town very soon (August 22-28th) like one long anticipated circus train. I should start blogging about bike rides in Colorado, but it is 98 degrees (37 C) here in Denver. Hot and dry with major thunder and lightening storms in the evenings. Much more conducive to sipping drinks under the shade of a tree, outdoor concerts, and trying all the new restaurants popping up around town these days. But do please come to Colorado in August for the big race. By then we will surely be in a drought, our green hills will be brown, the snow will have finally melted, and we will all be out on a bike traveling in one long line from one town to the next across this glorious state. You will be amazed by our blue skies, rivers, mountains, micro-breweries, and picturesque small western tourist towns. If you can't make it out to the race, then the scenery will be worth your arm-chair-sports experience. Phil and Paul are right - Colorado will look incredible on HDTV. As Paul Sherwen said this past spring upon his first visit to Colorado, "flipping heck, I heard Colorado was beautiful." Every bike rider in the race will wish he had brought his kids along with him to Colorado. 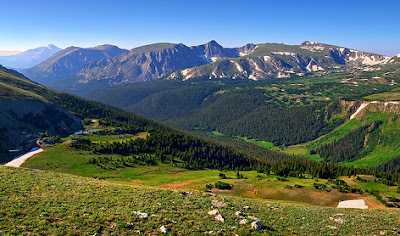 Fly fishing, hiking, camping, horses, wildlife - Colorado is an outdoor paradise for families, or the individual bike rider wanting to ride a bike at altitude. It is all new. An opportunity for fans to be part of a first year event, which could be scary unpredictable (locals do some weird things to bike riders in these parts: cow dung, tacks), but hopefully mostly fun and good times. Guaranteed to be beautiful!